Tips for becoming pet friendly! Need to find a pet friendly hotel in Lakewood CA? Click the Pet Friendly Accommodations Button below! Search here for local pet friendly businesses! Traveling with your pet, whether it is a dog, cat or even a bird, will make your vacation more enjoyable. On this pet friendly city page, and thousands more like it, all over the world, you will find everything you need from pet friendly hotels to the services that will make your trip more enjoyable. 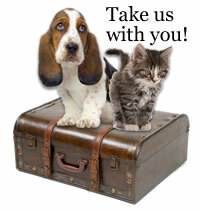 It's easy to find pet friendly hotels in Lakewood with PetTravel.com. Just click the SEARCH button above for a list of pet friendly hotels, motels, bed and breakfasts, small inns, and vacation rentals in Lakewood. Be sure to mention PetTravel.com when you make your booking! If we have information for other pet friendly services in Lakewood, a second search button will appear that will include pet friendly beaches, parks, and other fun things to do with your pet. We welcome your emails regarding pet friendly services in your town. Just send an email to info@pettravel.com and we will add them to our database. Come back often as we are always adding new and exciting places for you to visit with your pet. We even offer pet sitters in selected cities who will "petsit" your best friend while you go out to dinner in Lakewood. Traveling Internationally with your pet? You can find pet immigration rules and passport forms for over 190 countries by visiting our Pet Immigration Information section. Search for all of the pet travel information and resources you need for a perfect vacation with your pet on PetTravel.com!